Dan Rockhill is the J L Constant Distinguished Professor of Architecture at the University of Kansas and Executive Director of Studio 804. He and his students have recently completed six LEED Platinum buildings in Kansas. Their other awards include three American Institute of Architect’s Honor Awards, two Wood Design Awards, along with Steel Design, Global Housing, Sustainable Design, National Affordable Housing, two time winner of the NCARB Prize, two time winner of Architecture Magazine’s “Home of the Year” and multiple awards from Residential Architect including the Grand Award in 2011. Describe your office culture in general then how it relates to cultivating a strong design process. The office is quite small, just a handful of us in the Rockhill and Associates work but the work I do with students, Studio 804 and the subject of the bulk of my presentation, varies with the student count but on average is about 18. What inspires your design? Where do you find design inspiration? We like to think the design eventually finds itself through a combination of the program and the few places we can find to bring something special to it. We don’t have lofty aspirations punctuated with rhetoric about what we do but rather see every project as an opportunity to do good work and create something that speaks architecturally. Over the last several years we are increasingly drawn toward producing environmentally outstanding projects in an effort to demonstrate to the public what we think they should expect of architects. A dream client doesn’t micro manage but respects what we do and at the same time brings enough money to the table to actually be able to afford what they are asking us to do. Are there unique ways you engage your client in the design process? I prefer clients let the professionals carry on with the task at hand and despite the large amount of community driven work we do I prefer to not engage them any more than absolutely necessary. I know this sounds elitist but in my experience the best work comes from a vision of what can be created by someone with experience. I don’t think good design comes about by a group of amateurs talking over their needs and expecting the design to reflect their every concern. There is the current topic that architecture graduates and young interns are not prepared when they enter the real world or the profession. What have been some key things about the real world and the design profession you've learned that you wished you learned early on? I needed to have someone make me do the things I make my students do today. I would have learned alot more in much less time. Any other advice to young architects or students or those wanting to study architecture? Appreciate how little you know and constantly work hard to learn so that eventually you can do good work, maybe. Organizations like Architecture for Humanity have brought forth the importance of architects and good design in humanitarian efforts. Also, the keynote speaker at this year's national convention is the founder and CEO of TOMS shoes Blake Mycoskie. Have you been involved in humanitarian projects? We are doing this kind of work most of the time. Why do you think this kind of work is important for you or the profession? I live by the motto that you take a little and you give a little back, it’s that simple and if more people tried it we might have a little less trouble in our world. 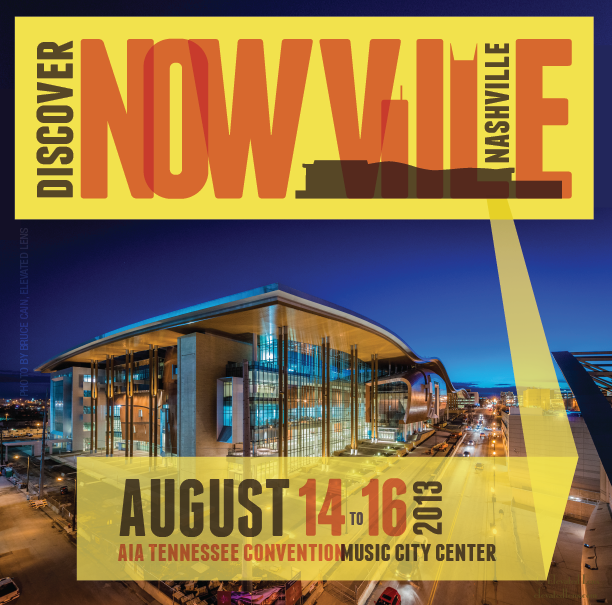 The theme of this year's convention is Nowville, a term GQ magazine used recently to describe Nashville, a current city on everyone's radar as a place to live, play, and work. Nashville like all great cities has a unique character that attracts visitors but also cultivates the life of its residents. What do you see as important ingredients to a great city? It should be authentic and resist the temptation to make it into a theme park. What Ada Louise Huxtable titled her book Unreal America: Architecture and Illusion. What role does the architect need to play in this? They should be part of every last bit of it. Describe your impression of Nashville. 3 words. What are you looking forward to on your visit to Nashville? What are you looking forward to in attending the convention? I look forward to the other presentations, the new work in the city, the exhibits, etc. I’ll be happy to have concrete under my feet, I live in the sticks so being in a city is a big thrill for me. What's on your playlist in the office as you work? What music gets you motivated? Anything about yourself not many people know that you'd like to share, such as another talent. I raced C-Gas and C-Modified Production classes at Islip Speedway and held the land speed record for a short time at the drag strip, I think. 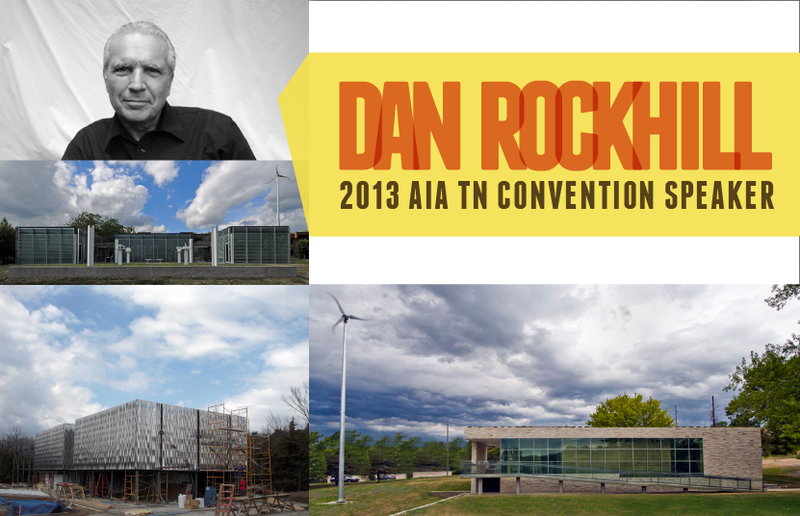 We look forward to his presentation at the AIA TN convention this August entitled, "Design and Construction: Hand and Mind, the work of Rockhill and Associates and Studio 804." Read more about him through the links and resources below, and stay tuned for more speaker interviews. His book Designing and Building: Rockhill and Associates is available from Amazon or TUNS Press in Halifax, NS. Interview and graphics by Sophorn. Photo in save the dave banner courtesy of Bruce Cain, Elevated Lens. Do you guys have any of these left? I'd love to purchase one.